SAVE THE DATE: March 16th, 2016, Museum of Goa. We are delighted to announce the 8th Edition of the Bellevue Salons, in collaboration with Chameleon Art Projects, and partnered with Museum of Goa and Charosa Wines, on the subject of ART + ECOLOGY: Genesis Eternal - Art Production, Sustainable Materials and the Environment with Shilpa Joglekar, Sanvar Oberoi, Kanchi Mehta & Subodh Kerkar. Followed by a performance withRomain Loustau. 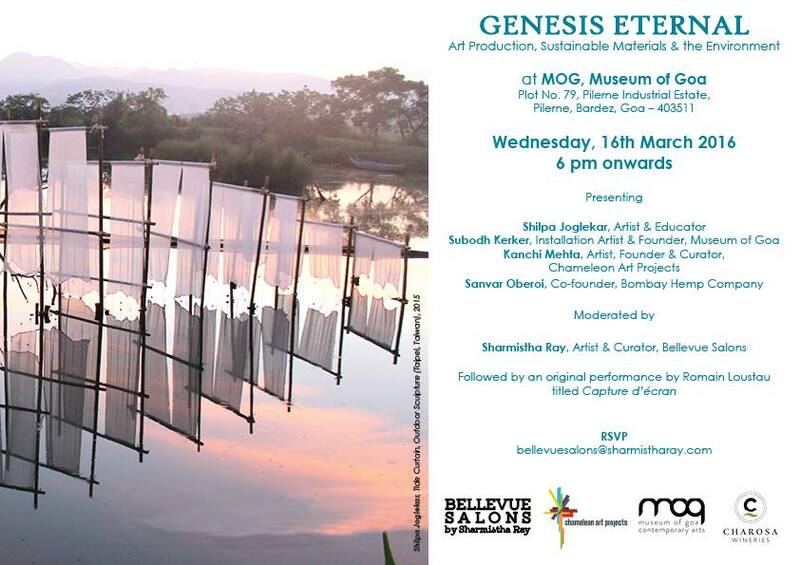 We look forward to having you for the presentations, salon, performance & festivities.— with Kanchi Mehta, Shilpa Joglekar, Romain Loustau and Sanvar Oberoi at MOG - museum of goa.